The growth of the church in the UK from mid 1730s to the 1870s was due primarily to revivals giving a large number of conversions. The twentieth century decline of the UK church is due to a lack of revivals and their associated conversions. A key graph is reproduced from  to illustrate these theses, figure 1. The graph shows the growth of the church as a percentage of the total population up to the 1870s, with the various Welsh revivals that drove that growth indicated by vertical lines. Percentage growth indicates the presence of conversion over and above the retention of the children of church members, regardless of the birth rate. Subsequently there is proportional decline, with only one major revival left in 1904/5. There are people who object to the thesis that church growth is caused by revivals. Instead they claim revival is a social fad, with church growth having natural, rather than spiritual, causes. These objections need addressing. Consider four common objections. 1. Church growth during revivals was due to population growth. I have already demonstrated that this is not the case, as denominational growth during the 19th century was faster than population growth. Figure 1 shows church membership as a proportion of society. Even if the church retained all its children then there must have been conversions in addition. It turns out that child retention at the end of the 19th century was only 50%, a rate of 1.45% of the church per year, with conversions from outside only just less at 1.26% per year [1,2]. During the 1904/5 revival there was a sudden increase in conversions to 6% per year, far more than child retention, without any sudden increase in population . Revival gave conversion far above biological growth and thus has more effect on church growth than population growth. 2. Church growth during revivals was due to miners having to join the chapels of their managers . As can be seen from figure 1 most of the revivals in Wales were over by 1859/60. There were only a few very minor local revivals until the last national one in 1904. However the bulk of the South Wales coalfield was not built until after 1860. This can be illustrated by the fact that South Wales coal production in 1854 was only 8.8 million tons compared with 57 million tons by 1913 . Likewise the Rhondda valley, famous for its coal production, only had a population of 3035 in 1861, compared with a massive 113,735 in 1901 . Sometimes people are surprised when they see few references to the Rhondda Valley in accounts of the 1859/60 revival. The reason is that there were very few people there at the time! Industrialisation came later. Thus the period of largest population growth in coal mining areas occurred when there were the least number of revivals. What is more likely is that the massive number of internal migrants had already been converted in prior revivals elsewhere, and then chose their chapels in line with the jobs they obtained. But this made no difference to the national increase in church membership . 3. Church growth was just transfer from other denominations. Data shows that all denominations in England, Wales and Scotland grew through the 19th century. It was a century that saw a huge rise in religious participation, especially in the first half . 4. The 1904/5 revival had no lasting effect on Wales. In comparison to the previous revivals this is true as the churches declined during the 20th century. It was a revival out of time, see figure 1 . 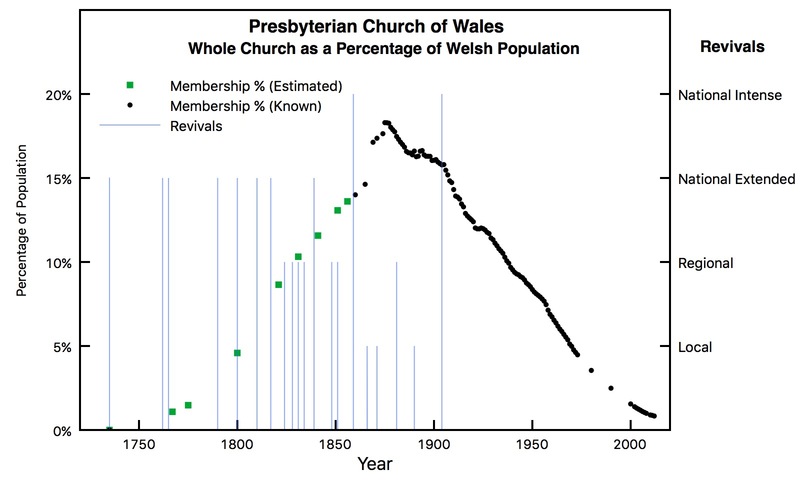 But the previous fifteen or more revivals had effects of more than a generation, massive church growth, and a changed religious and moral landscape in Wales. That is why the country came to be known as a land of chapels and revival. Hopefully this deals with four of the common objections to the reality of revival as the cause of church growth in the 19th century. That century saw a dramatic rise in UK church participation due to the work of the Holy Spirit, especially in conversion. It was a time of God given revivals, as was most of the 18th century. The contrast with the 20th century decline and lack of revival is striking. Why revivals have ceased demands an explanation – that will be the next blog. That churches only grew because miners needed to join the church of their managers to get work is one I have heard many times from churches in Wales. They even claim they have seen the membership books to prove it! For some reason it is church members and ministers who are amongst the most sceptical about revival, and that is across all churchmanships, evangelical included. Perhaps it is fear rather than scepticism that drives this incorrect theory? 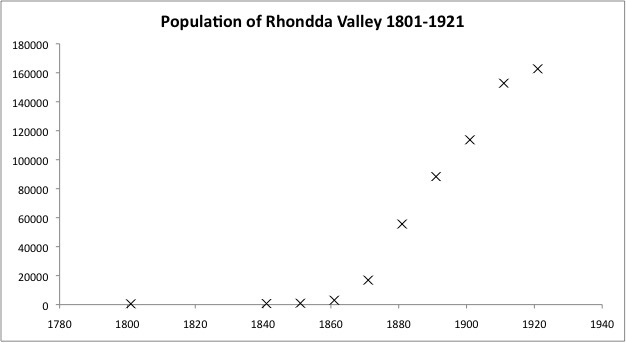 The population of the Rhondda Valley 1801-1921 is given in John, A.H. (1980). Glamorgan County History, Volume V, Industrial Glamorgan from 1700 to 1970. Cardiff: University of Wales Press, and helpfully reproduced on Wikipedia: https://en.wikipedia.org/wiki/Rhondda A graph is below, figure 2. Although there was massive chapel growth in the Rhondda from 1870 due to internal migration, this was after the main period of revivals. There was a local revival in the closing decades of the 19th century, and much evangelistic activity, but the bulk of national converts predates the development of the Rhondda Valley, except the 1904/5 revival. Data for chapels in the Rhondda Valley show massive increases in membership during the 1904/5 revival, far more than can be explained by a sudden rise in employment. For example chapel membership of one town, Ton Pentre, increased by 60% from 1901 to 1906, most of the growth in 1905. This growth is replicated across all the Rhondda towns. Mining and population did not increase that fast on that timescale. Data from: Kidger M.E. (2012). Colliers and Christianity: Religion in the Coalmining Communities of South Wales and the East Midlands C1860 to 1930s with s Particular Focus on the Rhondda Valleys in South Wales and the Hucknall and Shirebrook Areas in Nottinghamshire and Derbyshire. PhD Thesis. University of Nottingham. Williams J. (1985), Digest of Welsh Historical Statistics, Government Statistical Service HMSO. Currie, R., Gilbert, A. D., & Horsley, L. S. (1977). Churches and churchgoers: patterns of church growth in the British Isles since 1700. Oxford University Press, USA.